The mayor of an Alaska town and her mother, who were in town for a tour of the White House, are dead after they were struck by a tour bus in D.C. Wednesday night. WASHINGTON — The mayor of an Alaska town and her mother, who were in D.C. for a tour of the White House, were struck and killed by a tour bus Wednesday night. Skagway, Alaska, native and Mayor Monica Adams Carlson, 61, and 85-year-old Cora Louise Adams of Elbe, Washington, were in the crosswalk on the intersection of Pennsylvania Avenue and 7th Street Northwest when they were struck by a 2013 Prevost H3 passenger bus shortly after 9:30 p.m.
D.C. police said they believe the bus was traveling northbound on 7th Street Northwest and made a left turn onto Pennsylvania Avenue Northwest when it struck the mother and daughter. The women were taken to a hospital with life-threatening injuries where they died. Police have not identified the driver of the tour bus or if charges against the driver would be filed. Carlson and her mother were in D.C. for a tour of the White House, set up through Alaska Sen. Dan Sullivan, R-Ala., according to Steve Hites, president of Skagway Street Car Tour, where Carlson also worked. 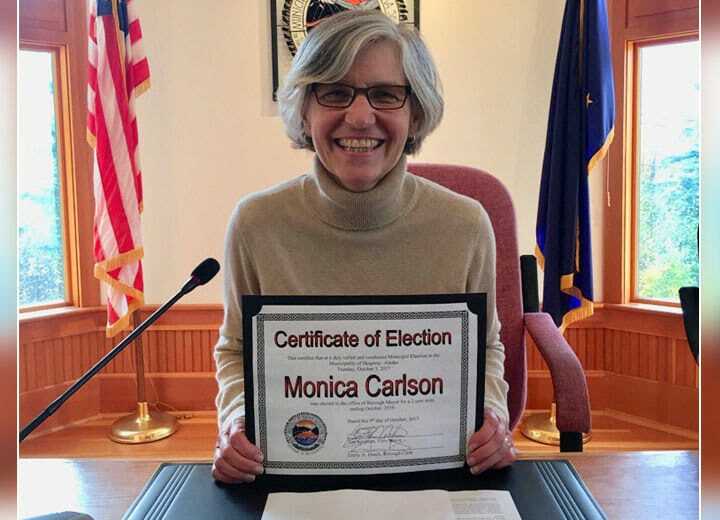 Carlson, who had been elected in a write-in campaign in October 2017, had one more year in her term as mayor of Skagway and also served as the director of tour operations at Skagway Street Car Tour since 1996. She worked as a tour conductor for the company for several years before that, Hites told WTOP. “She was very proud of her town and was a good mayor,” Hites said in an email. Skagway is about 100 miles north of Juneau, Alaska’s capital.